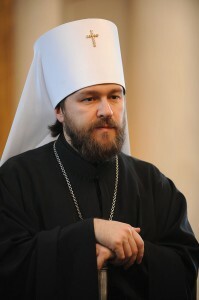 Metropolitan Hilarion of Volokolamsk, chairman of the Moscow Patriarchate’s Department for External Church Relations, sent Christmas greetings to the heads of the non-Orthodox Christian Churches. Among those whom he addressed were Pope Francis; Archbishop Justin Welby, head of the Anglican Communion; Archbishop Kari Mäkinen, head of the Evangelical Lutheran Church in Finlan; Praeses Nikolaus Schneider, President of the Council of the Evangelical Church in Germany, and the heads of other non-Orthodox Christian Churches. The text is given below. Please accept my heartfelt congratulations on the great and joyful feast of the Nativity of Christ. The coming into the world of ‘the desire of all nations’ (Hag 2:7), the Son of God, as witnessed by the angelic glad tidings: ‘For unto you is born this day in the city of David a Saviour, which is Christ the Lord’ (Lk 2:11), has transformed humanity by rendering possible for all those who believe in him to ‘receive the adoption of sons’ (Gal 4:5). In these holy days we fervently call upon each who confesses the name of Christ to come to the defense of Christians suffering in various parts of the world, for ‘God hath called us to peace’ (1 Cor 7:15). In praying for the peace of the whole world we are making all efforts to aid the resolution of international problems by peaceful means. I wish you the abundant grace of the Divine Infant who has been born, good health and God’s aid in good deeds.